Beep beep beep! Your host is in Paihia in New Zeland. Today it’s time to do a full day optional. A few of us waited for the bus to arrived. We’re going to drive to the most northern point of New Zeland’s mainland. Cape Reinga, the 90 miles beach and some other places. I won’t write much about this trip, because it was pretty boring. First we drove to a place where we could buy some lunch and snacks for the tour. Then we headed to the famous 90 miles beach, where we drove with our bus on the beach. First opportunity to take a group photo 🙂 After this 20 minutes stop, we made our way to a place to have some fun. Sand boarding! Time to continue our journey to Cape Reinga. Yes! More driving. We arrived at about 2:30pm and walked he rest to the light house, where we could enjoy the strong sun of New Zealand. Later we enjoyed lunch and spent more time with our Awesome NZ driver . He took us to a rainforest, where we hugged a tree and made a short walk through a rainforest. We made our way back to Paihia in the late afternoon with a short stop at a ice cream shop. The ice cream’s very good. Maybe I remember the name of the shop later. Beep, beep, beep! My alarm clock wakes me up! It’s 9 am. Day of Grand Explorer tour Shower, checking my baggage and day bag. Time to meet our tour manager in the hotel lobby. It’s about 11 am. Time to sign some contiki documents and fill the contact sheet with my details and get to know with my tour mates. Other than on my first Australian contiki tour we had no late arrivals this time and departed on time. On our way to Paihia we made a stop at Parry Kauri Park. This famous reserve is the home to many of New Zealand’s ancient Kauri (a native tree). Some of the Kauri are 50ms high and over 1000 years old. Then we continued our journey up to Paihia. While on the way we already had to choose which optionals we want to do on the northern Island. For Paihia I decided to do a Full day tour to the most northern point of New Zelands mainland and to go Para sailing! We arrived in the late afternoon in Paihia, after finding our room and storing our luggage, it was already time for our first activity. Parasailing! A group of us headed to the harbour where we boarded a fast motor boat. A few minutes of cruising and the first team is in the air. Most of us did the 2 person parasailing, it’s fun to talk with somebody while enjoying the panoramic views of the area. I believe Peter and me enjoyed the views as the third group. 10 minutes later and it was time for the next group. Later at night we had dinner at the hotel. The owner and his wife made some steaks and appetizer. Really delicious! First opportunity to get to know each other. Many awesome people are on this tour. Later we had a bit fun at a little bar. NZ 2012 Day 4 – Explore Auckland and its night life! My second day in Auckland. I am ready to explore the City of Sails. After a good nights sleep I decided to look for the next Starbucks Coffee House. It’s about 1km away from the Mercure Auckland. At about 10:30 I enjoyed my first Frappucino in New Zealand. After checking my emails and looking for Auckland attractions on my Netbook, I headed to my hotel room to store my netbook. Netbook stored, sun glasses and smartphone packed. Ready to explore! I believe I walked 6 hours around Auckland and later in the afternooin I received a facebook message from an Aussie girl that I met one year ago. The wrote that she believed that she just saw me. I am on the other side of the world and somebody I met over an year ago recognises me again. Awesome! Good night guys! Tomorrow starts my Contiki New Zealand tour. After a relaxing long night we’re finally in the Tasman Sea between Australia and New Zealand. It’s time for breakfast. I decided to eat an Omlet. It was okayish. We arrived on time at 9:30 in the morning at Auckland International Airport. After walking through the airport and through immigration and baggage claim I finally made it to the public area in 1 hour. Need a sim card for your phone? In the departure hall is a Vodafone store located. They sell sim cards (prepay sim) and phones. I opted for a prepay sim with data package as addon. Are all people so nice at the airport. Even the girl at this Vodafone New Zealand store is so kind. She asked me what type of phone I have and what I want to do with it while I am in New Zealand..
A recommed the supa prepay sim starter kit for under 30 NZD. Itcomes already with a data package and 2500 free text messages to any NZ mobile phone. It also givves you the choice to add more addons like data packages and international calling minutes. Then I headed to the currency exchange counter. Another friendly person greeted me. Are all people so nice in this country? I exchanged Euros and Australian dollars into New Zealand dollars. Smartphone – checked. New Zealand cash – checked. What’s next? Let’s get to the City of Sails also known as Auckland . I already knew that there’s a direct bus line right outside the International Terminal. I walked to the bus line counter while I started talking she saw my Contiki document wallet and said hat I can pay directly at the bus. I would get a 15% discount when I show the document wallet to the bus driver. I enjoyed the ride to Auckland downtown. About 45 minutes later I arrived at the bus stop right across my hotel. The Mercure Auckland. The entrance to the lobby is a bit hidden, but found it. I checked in and took the elevator to the 8th floor. Yeah Harbour view! 🙂 (I booked it for 45 €/ night). 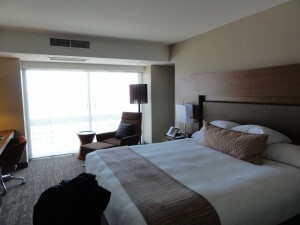 The hotel is pretty nice, clean and right in downtown Auckland. The day is still early, time to explore the City of Sails.I walked to the Harbour and enjoyed the wind and the fresh air. Later I contacted a girl from Wales who’s also on my Contiki tour in New Zealand. We met in the lobby and walked to the harbour a freshly made Subway sandwich. On the other side of the world with a nice girl from Wales enjoying together the great night weather with a healthy sandwich. I went to bed early, as a got a bit tired. My plan for the next day: Explore Auckland! It’s January 11th. We’re still onboard my flight SQ325 to Singapore. As mentioned on my post before, I enjoyed a really delicious dinner onboard SQ325 to Singapore Changi Airport that I spent some time with KrisWorld the inflight-entertainment system of Singapore Airline. I took a nap (3 hours or so). While the morning of the new day had arrived in Europe, we were still flying into Singapore and enjoyed a hot breakfast in the afternoon. We arrived at about 4 pm at Singapore Changi Airport. This airport is awesome! Whenever I am flying to Australia and New Zealand I have to make a stopover here. This airport has everything. From free movie cinema to free foot massage, and plenty of dining restaurants. I planned my flight to New Zealand with a 4hrs stopover in mind. My connection flight SQ285 is scheduled for 9:10pm. There I enjoy the nice transit area of Changi Airport. But first, time to get a free WiFi password. After heading over to the next information desk I made my way to the next Boost! Juice bar for a healthy and delicious smoothie. 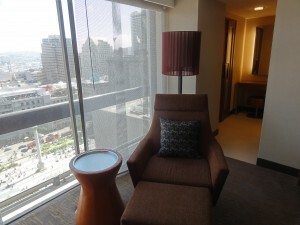 Then I headed to a nice sitting area to update my travel blog and checking my emails. Changi Airport not only offers free WiFi, also desks with sockets for mobile computers. Our flight to Auckland departed almost on time. After departure welcome drinks were served y the lovely Singapore Girls. Dinner time! I decided to choose the Thai chicken with fresh vegetables. My seat neighbors were a british couple. I enjoyed a really delicious dinner, watched some tv shows and enjoyed another Singapore Sling. It’s January 10th. It’s time for another trip around the world. A few month back I decided to book a trip to New Zealand. I’m looking forward to 21 days of exploring awesome places and meeting amazing people. Before heading to the land of Kiwi’s I have to fly from Munich to Frankfurt via Singapore and then straight to Auckland, northern Island of New Zealand. 5:30am. A very loud alarm sound wakes me up. I verified my packing list. Time to board the next train to Munich Airport International. 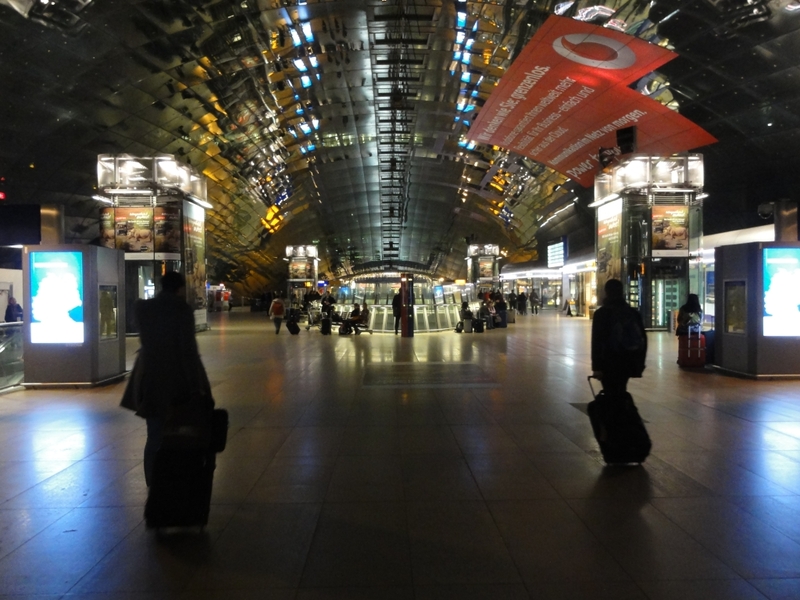 I arrived at around lunch time at Frankfurt International Airport. Unfortunately boarding starts as early as 3 hours before departure. Which means, I can check-in at around 7 pm. The check-in queue at the Economy class counter for my flight was empty, but have a look at the counter next to mine. It took me about 20 minutes to go through the customs and border counters, because many international flights departed from the same terminal satellite. That means over 200 people processed by 2 customs & border officers. 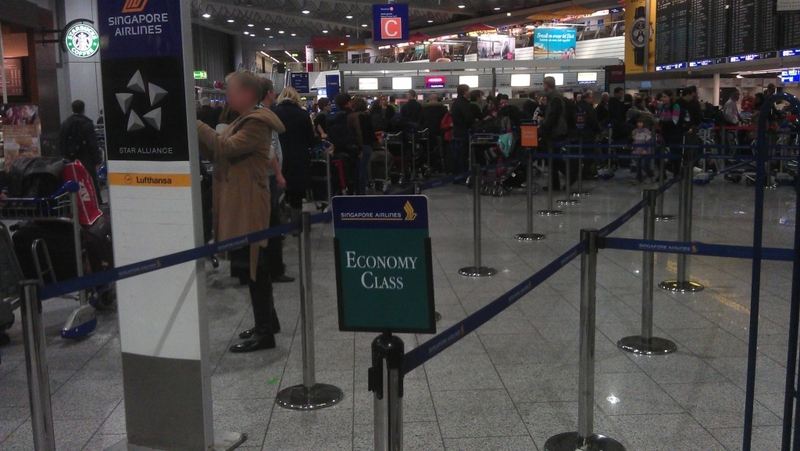 Anyway, I expected the typical Frankfurt delays and went to the gate early. Boarding for SQ328 from Frankfurt to Singapore Changi Airport started almost on time. Our flight departed around 15 minutes after schedule. I saw a big Thai Airways long-haul aircraft next to ours, while we waited for the remaining passengers to board. I had my first meal on Singapore Airlines short after midnight. Stay tuned for next part of my trip report. The whole hotel is very classy and in my opinion it should be understood as a premium business hotel. I booked a King Room. Unfortunately, the room was located to the street side instead of mountain view. The King Room has a small balcony with table and two chairs. The bed, typically for Hyatt, very comfortable. The room is very dark, almost all the furniture is dark brown, as is the bathroom. Elegant style! Everything was very clean. In the bathroom you can find the Hyatt standards: bathtub with shower, shampoo, body lotion and toothpaste. The concierge next to the front desk can book shuttles from SuperShuttle. The shuttles takes you to LAX within approximately 45 minutes. A useful Hyatt Fast Board terminal is also offered in the hotel lobby. Early flight and no time for breakfast? A Starbucks can be found directly in the lobby. Sweet! Near the Hyatt Century Plaza are many banks, a Westfield Shopping Mall and several bus stops. Walking time to Beverly Hills is about 25 minutes, where you can enjoy a very good dinner. Hyatt has meanwhile become my favorite hotel chain, therefore I decided to make a trip to Hawaii on my this year’s visit of San Francisco . I arrived at about 10:00pm by shuttle at Hyatt Regency Waikiki Resort & Spa. The first I noticed : The hotel has no doors, you go with an escalator directly into a lobby, in the atrium you will find shops and cafes. At the front desk greeted me a very friendly Hawaiian. She looked at her computer and saw that I am Hyatt Gold Passport member. Upgrade to Deluxe Ocean View and breakfast! The room was in the 18th Floor, which is already very high. After a corridor you will find in your room 2 queen beds and a balcony. On the balcony are 2 chairs and a table. A magnificent view over the sea and the main street of Waikiki. The bed is very comfortable . The room is clean and very quiet, and I have not heard any neighbors. 🙂 In addition,they fitted the room with a desk with lamp . The bathroom has a bathtub with shower. Bodywash, conditioner and body lotion from Na Ho’ola Spa (the hotel’s spa) are available in the bathroom. Since I had been upgraded to Deluxe Ocean View with breakfast , I decided to try the breakfast buffet. They offer cold and hot dishes, fresh juices and fruits, including coffee. Espresso and other hot drinks must be pay extra. Breakfast tastes delicious. The tables are outside on a roof terrace with views of Waikiki Beach. Unfortunately, in July 2011 were some renovation works performed. Which means that some restaurants and the pool were not available. Upon request, free beach kits were offered and you can use the swimming pool of a hotel a few blocks away. In the lobby is also located an Activity Desk from Expedia. Here you can seek advice and book city tours, tours to Pearl Harbor or submarine tours. The staff is very friendly and helpful, they really took time for me. I did a submarine tour and really liked it. The submarine tour package includes free pickup at the hotel and transfer to the submarine at sea. The beach is located directly across from the Hyatt Regency Waikiki Resort & Spa. Right on the beach is “Hyatt on the beach”, where you can order burgers and Shave Ice. Everybody should definitely try Shave Ice. It’s really tasty! Grand Hyatt San Francisco. I really love this hotel. The lobby is modern and it has this “you’re welcome” feeling. The staff at the reception desk is really nice and competent. Also, there are some Hyatt Check-in kiosks. After entering the room you see first a large, comfortable king-size bed, with a large number of pillows. Directly from the bed you look at a 37″ flatscreen TV with “premium channels”. A desk with lamp and a comfortable armchair are there to fill the room. 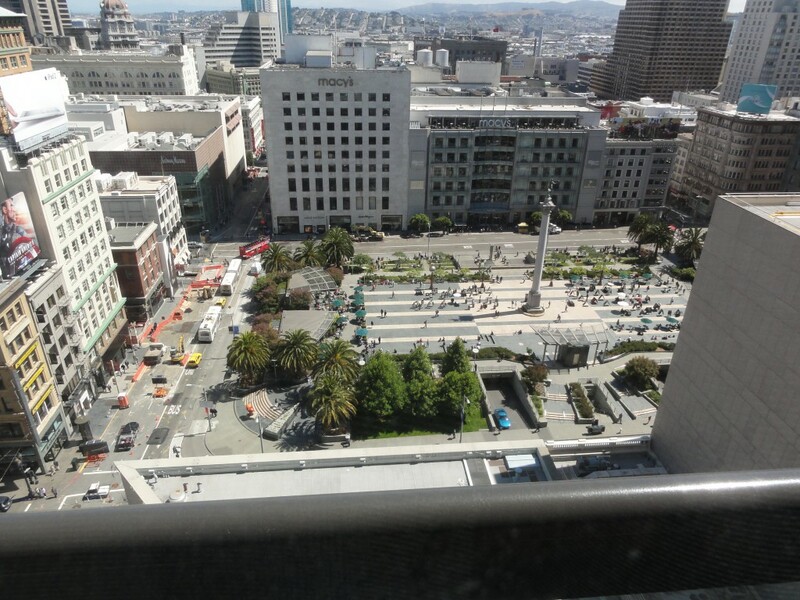 My first stay at a Grand Hyatt and I got a room on one of the “higher floors” with views of Union Square. Nice! 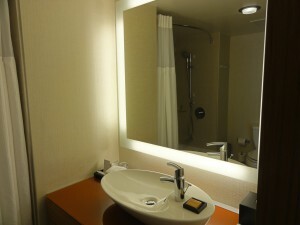 Going a little further, you will find a small hallway to the bathroom, there is a large, lighted mirror and a wardrobe. The bathroom has a tub with shower, modern looking sink and a mirror that is illuminated from all sides. Shampoo, conditioner, body lotion, and toothpaste are standard at the Grand Hyatt San Francisco. The room features wireless Internet (WiFi), starting from $ 9.95 per day. For Hyatt Gold Passport Platinum members is this free. The Grand Hyatt San Francisco is located at Union Square, one of the most important places in San Francisco. Directly opposite you will find a Macy’s Department Store. Several Starbucks coffee houses are located around the square. Various sightseeing tours start right at Union Square. Australia, see you soon again! A shuttle picked me up at the Tropical Queenslander at 10:20 Boarding started at 11:40. So just 1:20 hours to get to the Cairns International Airport, to check in, have breakfast and for boarding. In fact, everything is very relaxed but still very good. 10:35, I was already at the Cairns Airport Domestic Terminal, just checked in , and yet I still had almost 45 minutes until boarding. Enough time for breakfast. In the terminal I met also some of my tour mates. The german girl, Kat and Louisa. While The german girl was already a bit earlier boarding her flight to Alice Springs , I was still waiting for my flight to Sydney International Airport – Domestic Terminal. Boarding for my connecting flight to Singapore was at 16:10. At 16:01 I was still waiting for my shuttle to the International Terminal. 9 minutes! At 16:10 I stood at the security checkpoint. Unbelievable 16:12, everything smooth and I was able to run through the terminal. At 16:15, I stood near the gate and found out that they hadn’t not yet started with boarding. The transfer time was dimensioned tightly, but still coordinated very well. E.g. Thanks to the high flight punctuality of Qantas. Our plane started on time towards Singapore Changi Airport. See you next time Australia! I’ll be back soon!